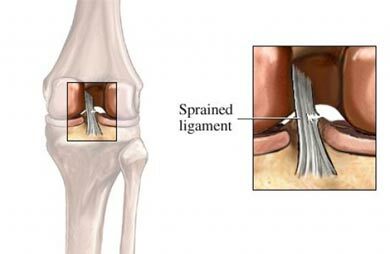 A knee sprain is the stretching or tearing of ligaments that support the knee. Ligaments are strong bands of tissue that connect bones to each other. You will be asked about your symptoms and how the injury occurred. The knee will be checked for stability and pain. A minimally invasive procedure may be done to look inside of your knee. This is called an arthroscopy . 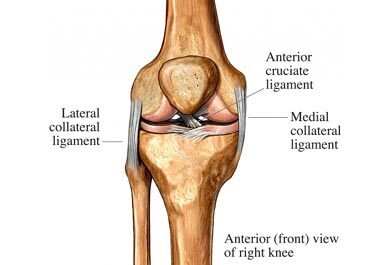 Knee sprains are graded according to their severity. R est—Avoid putting any pressure on your knee by not walking on that leg. I ce—Apply ice or a cold pack to the knee to reduce pain and swelling. C ompression—Wrap your knee in an elastic bandage to limit swelling. E levation—Keep the injured knee raised above the level of your heart. This will help drain fluid and reduce swelling. Crutches may be needed to keep pressure off of the knee. A brace may be recommended. Some may keep the knee from moving at all. Other braces may allow some movement and provide support when returning to activities. Braces are not advised for children. Exercises may be advised to to help restore flexibility, range of motion, and strength. You may be referred to a physical therapist. Surgery may be needed if a ligament is torn completely. Warm up and stretch before exercise. Cool down and stretch after exercise. Take a break from sports and exercise when you feel tired. Do exercises that strengthen the leg muscles. Learn the proper technique for sports and exercise. This will decrease stress on all muscles, ligaments, and tendons, including those around the knee. Also, wear the proper equipment. Ask your doctor if you should use a brace. Birmingham TB, Bryant DM, Griffin JR, et al. A randomized controlled trial comparing the effectiveness of functional knee brace and neoprene sleeve use after anterior cruciate ligament reconstruction. Am J Sports Med. 2008;36(4):648-655. Donnell-Fink LA, Klara K, Collins JE, et al. Effectiveness of knee injury and anterior cruciate ligament tear prevention programs: A meta-analysis. PLoS ONE. 2015;10(12):e0144063. Available at : http://journals.plos.org/plosone/article?id=10.1371/journal.pone.0144063. Accessed June 2, 2016. Martin TJ. American Academy of Pediatrics: Technical report: knee brace use in the young athlete. Pediatrics. 2001;108:503-507. Najibi S, Albright JP. The use of knee braces, part 1: prophylactic knee braces in contact sports. Am J Sports Med. 2005;33:602-611. Petersen W, Braun C, et al. A controlled prospective case control study of a prevention training program in female team handball players: the German experience. Arch Orthop Trauma Surg. 2005;125:614-621. Rayan F, Bhonsle S, et al. Clinical, MRI, and arthroscopic correlation in meniscal and anterior cruciate ligament injuries. Int Orthop. 2009 Feb;33(1):129-132. Roth J and Taylor DC. Management of acute isolated medial and posteromedial instability of the knee. Sports Med Arthroscopy Rev.2015;23(2):71-76. Sprains, strains and other soft-tissue injuries.Ortho Info—American Academy of Orthopaedic Surgeons website. Available at: http://www.orthoinfo.org/topic.cfm?topic=A00111. Updated July 2015. Accessed June 11, 2018. Sugimoto D, Myer GD, Micheli LJ, Hewett TE. ABCs of evidence-based anterior cruciate ligament injury prevention strategies in female athletes. Current Phys Med Rehabil Rep. 2015;3(1):43-49. Sprains and strains. National Institute of Arthritis and Musculoskeletal and Skin Diseases—National Institutes of Health website. Available at: https://www.niams.nih.gov/health-topics/sprains-and-strains. Updated January 30, 2015. Accessed June 11, 2018.